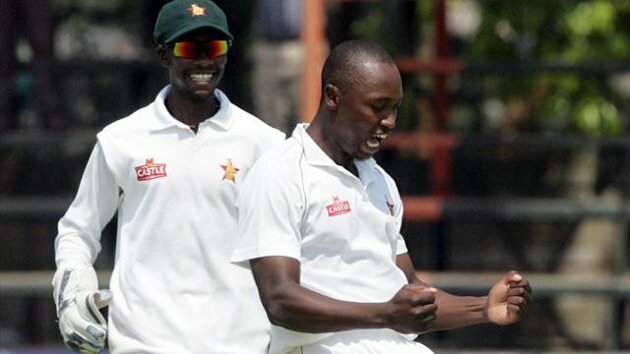 In the second test held between Zimbabwe and Pakistan, Zimbabwe won by 24 runs and leveled the series 1-1. The cup is shared by Zimbabwe and Pakistan in the 2 test match series. It seems to be historic win after 15 years against Pakistan by Zimbabwe. Tendi Chatara was the man to change the match to be historic record. He took five wickets in second innings which marks his career best 5-61 and that made Zimbabwe to make this historic victory. Tendai Chatara was awarded Man-of-the-Match award for his glorious bowling. The Pakistan captain's undefeated effort failed to mark a win. As Misbah said, Zimbabwe proved to be tough competitor. Zimbabwe won the toss and elected to bat first. The first wicket of the innings had fall at the second ball of the match. Tino Mawoyo was the man to go for 0 runs. Masakadza outstanding 75 and Zimbabwe captain Brendan Taylor 51 made Zimbabwe to put a good score in first innings of 294. Considering the Pakistan bowling, Junaid Khan showed an outstanding bowling and took 4 wickets whereas Rehman too showed his effort and took 3 wickets. Rhat Ali took 2 wickets and Saeed Ajmal with one wicket. Pakistan came to start its first innings batting by Khurram Manzoor and Mohammed Hafeez. Manzoor played a good match and scored 51. Next to him a good play was made by Younis Khan with 77 runs. The Pakistan captain Misbah-ul-Haq made 33 runs. The low order batsman showed poor performance. Thus first innings of Pakistan ended up with 230 and 64 runs behind Zimbabwe. In Zimbabwe bowling, Brian Victori showed an outstanding performance and took 5 wickets and put Pakistan under pressure. Panyangara took 3 wickets with good economy. 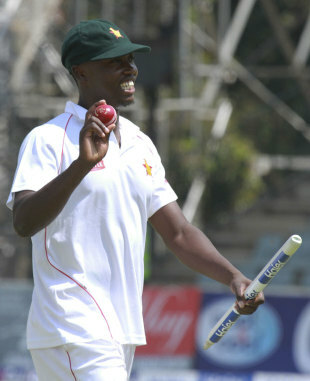 Tendai Chatara was left with 1 wicket. With a confidence, Zimbabwe started its second innings batting. Mawoyo who has departed for duck last innings showed his best performance in second innings and made 58 runs. Next to Mawoyo, good score was made by Masakadza with his 44 runs. Then other players had not performed well. Zimbabwe captain Taylor made 27 runs. Mutumbami, a low order batsman scored 29 runs. Thus Zimbabwe second innings came to end at 199 runs. In Pakistan bowling side, Rahat Ali took 5 wickets with a good economy. Ajmal and Rehman took 2 wickets each. Junaid Khan took 1 wicket. Pakistan had set with a target of 264 to win the match and the series. Manzoor as a opener made 54 runs and showed his good stroke. Next to Manzoor, Misbah-ul-Haq, captain of Pakistan made a undefeated standing but all his effort failed as no other batsman stood on the other side to support him. Thus the second innings of Pakistan end up with a score of 239 and made Pakistan to lose the match by 24 runs. 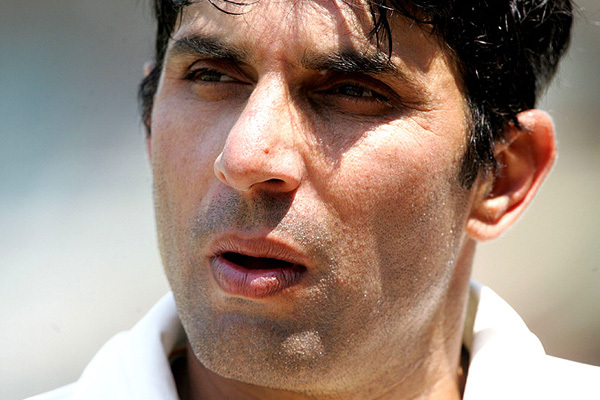 Misbah-ul-Haq’s stood till last undefeated with 79 runs. Considering Zimbabwe bowling Tendai Chatara made the break through by taking 5 wickets and made Zimbabwe to win the match. Man of the series goes to Younis Khan. 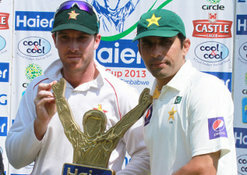 Thus the two test match series ended up with 1-1 and cup is shared by both the teams. It marked as a historic win and Zimbabwe which was not ranked earlier in test matches entered the top 10 table at 9th place ahead of Bangladesh at position 10. Pakistan was dropped two place in the table and came to sixth place. It’s a great come back for Zimbabwe. Share your views on this series and the teams.